I haven’t talked about Justin Marriott’s Paperback Fanatic, a wonderful magazine on paperback fiction of all genres, in a while, but this is too cool not to share. As I noted almost two years ago, this is a really fun magazine that offers a treasure trove of information on old paperbacks from a variety of genres. Individual issues sell out quickly, and back issues are almost impossible to find, but it is available via subscription at the main Paperback Fanatic webpage. It’s always been print-only until now. 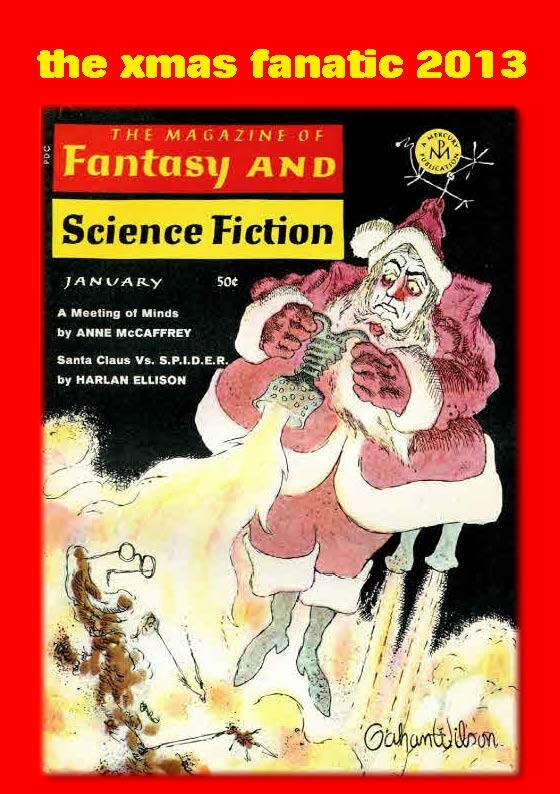 Justin Marriott has released a short electronic-only version, for free, that includes a really neat article by Nigel Taylor on some of the most interesting appearances of Christmas-themed stories in science fiction and fantasy works. It is available for Xmas card. As a thank you for your support throughout the year I attach The Xmas Fanatic, my first attempt at electronic publishing. I hope you enjoy Nigel Taylor’s look at SF and horror stories with a Christmas theme, and his own line-up for a horror themed Xmas anthology. Please feel free to distribute/forward/re-post as a way of spreading the word. There’s plenty of Fanatic related projects to look forward to in 2014. Issue 28 of The Fanatic is complete, and will be published at the end of January. It includes a couple of new subjects for The Fanatic, specifically JD books and some uber-rare film tie-ins that will blow your mind. Issue 29 and 30 are coming together very nicely, with one being dedicated to the theme of ‘renegade publishers’ taking in those paperback houses which were short-lived and/or operated on the periphery of the book industry. I’m also in the early stages of working with a paperback fanatic who has kindly agreed to provide scans of his superb collection of horror, SF and cult movie tie-ins, so I’m excited about the possibilities of what we might produce together. Please have a great Xmas and New Year. I’ve been writing way too many of these obituaries over the last few months. Have you ever read anything by Jack Vance? He’s one of my eternal favorites, and certainly one of the greatest wordsmiths I’ve ever encountered. I’ve always been surprised that he’s not better known; he’s a vastly underappreciated SFF grandmaster. I just learned that he passed away over the weekend. Locus has posted an obituary here, and you can leave a tribute message here. By all accounts Vance lived a full life; he was nearly 97, and my understanding is that he had been blind for many years. Still, the world is diminished for his loss. I’ve been collecting his work for roughly the last fifteen years. 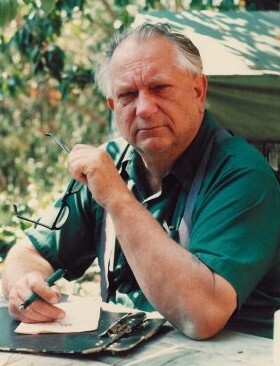 I have his entire opus: all six volumes of The Complete Jack Vance plus his autobiography, and many individual works, four of which he signed. I’ll never forget the first Vance story I read: “Mazirian the Magician,” one of his Dying Earth tales collected in the anthology WIZARDS, edited by Isaac Asimov, Martin H. Greenberg, and Charles G. Waugh. I encountered this truly amazing collection of fantasy stories when I was about 10-12 (take a look at the table of contents for that collection here). Requiescat in pace, Mr. Vance. I was a little worried when I first picked up PRIESTESS OF THE EGGSTONE because it is technically the second book in the “Fall of the Altairan Empire” series (the first is titled NEXUS POINT). This was an unfounded fear, as PRIESTESS OF THE EGGSTONE functions just fine as a stand-alone science fiction novel. PRIESTESS OF THE EGGSTONE begins as a classic example of the science fiction sub-genre I might term “commerce SF,” mostly about protagonists in space opera settings who work as, or want to be, freelance merchants and traders in the space lanes. Examples include many of C. J. Cherryh’s novels (the Merchanter and Chanur series in particular); Andre Norton’s Solar Queen series; and Poul Anderson’s Van Rijn series (there are many more I could mention, but those are some of the better known examples of this sub-genre). I hasten to add that – despite the emphasis on commerce rather than exploration or combat – these aren’t “mundane SF” novels. They aren’t about accounting in space, or paying all the required landing fees and dutifully obeying space regulations. They often involve encounters with pirates; misadventures in ports with thieves, customs officials, and thieving customs officers; and narrow escapes from a variety of dangers. In short, I have found that these kinds of novels typically involve exciting conflict without emphasizing the military derring-do that is all too typical of science fiction. PRIESTESS OF THE EGGSTONE is in good company. Here, a young female pilot with a troubled past, Dace, wants nothing more than to own her own trading vessel and become an independent merchant. The universe conspires against Dace’s attempts to achieve that dream. She’s a pilot not a navigator (dammit, Jim!) and so she hires a navigator who soon gets her into a world of trouble. 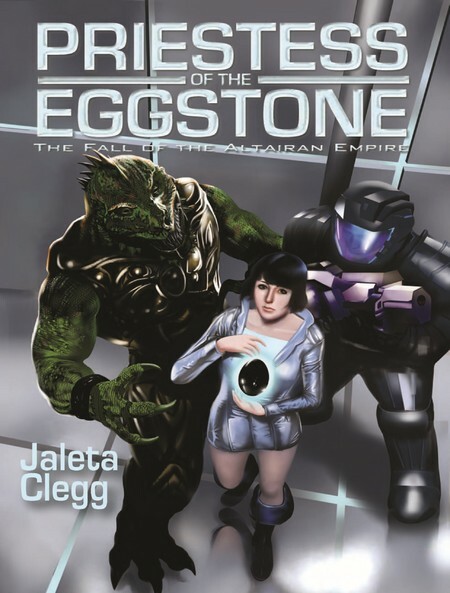 He has stolen the eponymous Eggstone, an object of unknown but great significance to an alien race that is willing to do whatever it takes to get the Eggstone back. They can’t simply return the Eggstone because it was already sold, so now the pair and their comrades have to locate it while dodging inimical aliens. Oh and the company that Dace works for is actually a front for a smuggling operation, so that causes further problems, plus the Star Patrol is still trying to pressure Dace to join them as an undercover agent (this was apparently the major plot of the first novel). The tone of the novel wavers a bit; at times, it seems fairly light-hearted, yet it never fully becomes a comedy. The stakes are real (and occasionally deadly). It’s a mix of commerce SF, first contact, and space opera-ish schemes and adventures. While having read the first novel was certainly not necessary, it would have provided some additional insights about Dace’s past. Her troubled origins are occasionally referenced, but the details are not entirely clear to me. I should also make clear that the protagonist is a young, emotionally immature woman, and one of her two love interests is an equally immature young man. This naturally leads to some frustrating behavior on both parts. The both behave childishly at times, so for a grumpy middle-aged reader like myself, this characterization occasionally annoyed me, but it never became intolerable. Wildside’s seventeenth “double” collection – packaged just like the old Ace Doubles, with two novels back-to-back, and two front covers – includes a post-apocalyptic tale by W. C. Bamberger and a dystopian novel by Robert Reginald. The two stories couldn’t be further apart in tone, though they are thematically linked: each concerns the trials and travails of ordinary people trying to cope with, and survive, the destruction of their societies. Mild plot spoilers follow for the two novels. 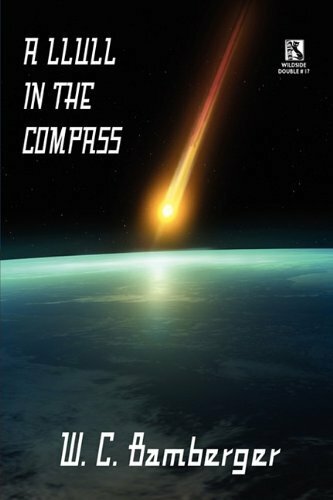 A LLULL IN THE COMPASS: A Science Fiction Novel, by W. C. Bamberger: Something very strange has begun happening across the world. More and more people have been disappearing, leaving behind small puddles of goo. Unknown objects have begun appearing in the skies, but burn up before reaching the ground. A small group of people, randomly thrown together, now wander aimlessly across the American landscape. Scared that purposeful movements bring about the disappearances, they select their path by following an improvised “Llull Machine” that randomly dictates where they will travel next. They also, perhaps most importantly, are trying to figure out what is going on in order to save their own lives and halt the collapse of civilization. As I was reading A LLULL IN THE COMPASS, I was reminded of the film Stalker, loosely based on ROADSIDE PICNIC by the Strugatsky brothers, about three men who wander around in an area once visited by aliens where the laws of physics aren’t always quite what we would expect. I have to admit that I don’t read a lot of what has been described as the “New Weird” (stories like those penned by China Miéville and Jeff VanderMeer), so I wasn’t quite sure what to expect from Bamberger’s novella. I also wasn’t sure what the “Llull” in the title referenced, so I had to research the interesting history of Ramon Llull and his strange machines. (Do yourself a favor and do a quick Google search on Llull.) Despite some uncertainties about plot, I enjoyed Bamberger’s novel even while I didn’t always know exactly what was going on; I think that’s probably part of the fun here. 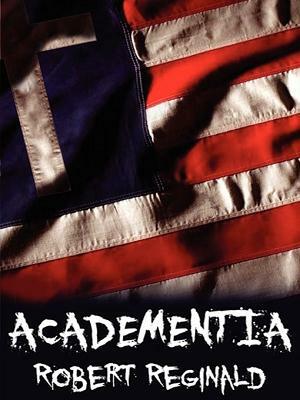 ACADEMENTIA: A Future Dystopia, by Robert Reginald: Near-future America is no longer a liberal democracy. A religious zealot named Dr. Theo Fell has instituted a new political regime that intrusively surveils the personal activities of all citizens, stifles free speech, tortures and kills dissidents, and becomes steadily more oppressive. (Sound at all familiar?) Our nameless narrator begins as a harmless academic but soon advances through the administrative hierarchy of the “California Saints University” system as his bosses are executed or dragged off to the re-education camps one by one. Life in such a dystopic state begins to take a toll on our narrator’s sanity as he struggles to not just survive but to overthrow Dr. Fell’s regime. For me, ACADEMENTIA was made all the more enjoyable because of Reginald’s undoubtedly quasi-autobiographical elements inserted from his lengthy career as an academic. This is a dark, dark tale, and like almost all dystopias, has some important things to teach us. I should say that as grim as the story is, it is also blackly comedic at times, which makes it all the more entertaining and makes it a little easier to digest as a reader. Let’s face it: a story like 1984 (one of my favorite books of all time) is powerful, but it’s also a bit of a hard slog because of its unrelentingly bleak outlook and prospects. Reginald’s writing is excellent as always; he manages to capture just the right tone balancing the darkness with just enough whimsy and absurdity. Despite how different in tone the two novels are, I heartily recommend this collection, especially for fans of dystopias. I thought that ACADEMENTIA was especially strong and easily worth the price of admission alone (other readers might prefer A LLULL IN THE COMPASS, though it was slightly out of my comfort zone in terms of its level of weirdness). As an academic myself, ACADEMENTIA really hit home with me for reasons it’s probably better I not go into. I hope that ACADEMENTIA garners greater attention – we can all use more warnings about the dangers of oppressive institutions and compromises to free speech. In the mid-twenty-second century, humanity has discovered the secret of faster-than-light travel (FTL) and has begun to colonize worlds across the galaxy. There is just one limitation to FTL travel: humans must be asleep during the voyage, and, while asleep, each traveler dreams. The dream is different for each traveler, but recurs every time that person travels through space. No one talks about their personal dreams, unsurprisingly since the dreams are closer to nightmares, and deeply resonant for each individual. Every now and then – not too often, but just often enough – the dreams drive someone mad. And sometimes people who go to sleep never wake up. 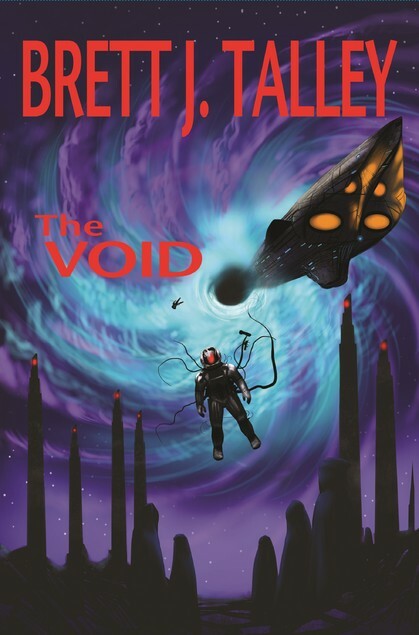 THE VOID centers on one starship voyage in which six people on a seemingly routine voyage happen upon another ship that had disappeared in the depths of space a decade previously. The crew and passengers awake prematurely during their trip, seemingly trapped in a field of black holes making navigation and escape almost impossible, and having few options but to investigate the derelict ship. Unsurprisingly, each of the travelers is more than they appear, with secrets in their pasts and hidden agendas, all of which surface on this trip. A few of the characters are more hastily sketched than others, but the characters and their pasts are interestingly interlocked, and one of THE VOID’s strengths. I won’t reveal the nature of the dreams or what the travelers find on the missing ship, lest I ruin key elements of the plot. Suffice it to say that the mysteries revealed were well done and genuinely scary. Comparisons between THE VOID and films like Event Horizon and Solaris are probably inevitable, but also a little misleading, as THE VOID avoids the gore of Event Horizon but is less introspective and more action-oriented than Solaris. I sometimes find that stories involving dream sequences and flashbacks hard to follow or too confusing to be worth the effort, but Talley demonstrates his mastery of writing here, doing a good job of keeping the story moving forward coherently despite the eerie dreamscapes the characters experience. THE VOID is haunting and thought-provoking. The characters, plot, and premise have all stuck with me since reading it and I can certainly see myself rereading it. Sure, parts of the plot are a little predictable, but then again, we know that this is essentially a Lovecraftian haunted house story set in space, so certain tropes and plot elements are almost expected. Highly recommended for those who like their science fiction mixed with horror. D. J. Butler’s “Arise Thou Niarlat From Thy Rest”: Contains a nice mix of existential Lovecraftian threat in the depths of space, along with some two-fisted pulp action, linked by one of Lovecraft’s favorite tropes, that of consciousness projection/possession from the far distant past or future. The story worked well, though presented just a little too vaguely at times. 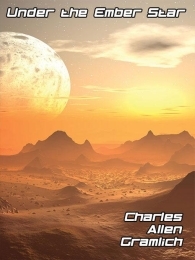 Michael R. Collings’ “Space Opera“: A classic tale of first contact between alien species, told from the perspective of the alien conqueror rather than a human. A great depiction of a truly alien mindset and physiology, as well as a setting obviously set after Lovecraft’s “stars are right.” Perhaps the most explicitly Lovecraftian of the stories in this collection, as well as the bleakest vision of the future. Well done. These first two stories, I should note, are really the only pieces in the collection to explicitly reference direct Lovecraftian elements. The rest of the stories still work thematically as Lovecraftian tales, it’s just that in the stories that follow, Lovecraft’s philosophy and common tropes are implicit rather than explicit, but don’t let that turn you off some good stories. Nathan Shumate’s “The Menace Under Mars”: A genuinely engaging story about a routine exploration mission on Mars gone horribly awry. Humans have begun to settle Mars and terraform it, but, well, they aren’t alone, and their terraforming efforts (nor surprisingly) have unpredictably bad effects. Lots of action and a real page turner. David J. West’s “Gods in Darkness”: Set during the height of the Space Race, this shows what was really going on in space when American astronauts and Soviet cosmonauts encountered each other and (literally) battled it out in space. Reminds me of Charles Stross’ wonderful novelette “A Colder War” (available here: http://www.infinityplus.co.uk/stories/colderwar.htm ) – and could actually be set in that novelette’s universe – though “Gods in Darkness” lacks the creeping, unsettling doom of “A Colder War.” This is a straight-up, high stakes action-adventure story and it’s a good one. “The Shadows of Titan” by Carter Reid and Brad R. Torgersen: Great adventure and exploration story set on, oddly enough, the moon Titan. The mission takes a dark turn when a structure is discovered there. Very reminiscent of some older adventure pulp science fiction stories, with a clever resolution. “The Fury in the Void” by Robert J. Defendi: A fascinating tale of future war in space between two rival factions – seemingly descendants of the Greeks and the Russians – who use the remnants of advanced technologies they can no longer build or maintain and for whom religious orthodoxy is of paramount concern. It’s a great setting (and one I’d like to see more of) that was clearly inspired by the wargame settings of Warhammer 40K and Battletech. I’d have liked to be shown more of the villains’ origins and motivations, but enjoyed the story nevertheless. “Flight of the Runewright” by Howard Tayler: Bleak story about the future use of what we would probably describe as occult means to travel faster-than-light across the depths of space. The story is told from the first-person present perspective featuring, obviously, a somewhat unreliable narrator who learns the truth of his situation along with the reader (I hesitate to say more for fear of ruining the story). I was pleasantly reminded of Stephen King’s story “The Jaunt” in some respects. Lots of fun. All in all, this is an amazingly successful collection of stories to combine cinematic science fiction – the genre of “space opera” clearly applies in all cases – with Lovecraftian horror. As you know, it’s rare to pick up an anthology and genuinely enjoy each story it contains, but that was certainly the case here. 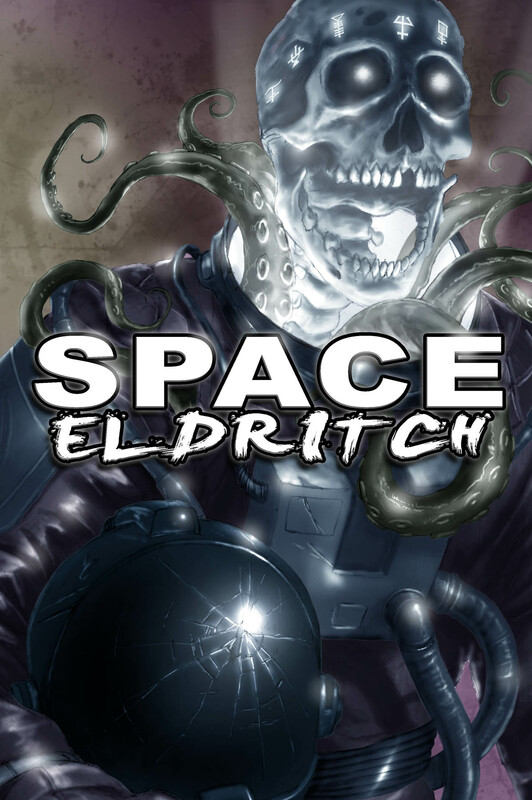 Each of the authors knows their craft well and shows off their writing chops in SPACE ELDRITCH. The writing is uniformly better than most of the science fiction produced in the 1950s and ‘60s, but the stories themselves would not have been out of place in that era. There’s certainly room for additional related stories for most of these, so I am holding out hope for a SPACE ELDRITCH II. I also have to briefly mention that wonderful cover art by Carter Reid as well – isn’t it gorgeous? The cover contains just the right mix of creepiness, tentacles, eldritch runes, and over-the-top cinematic science fiction elements to complement the stories found here. Unless you are true Lovecraftian purist who things that the Elder Gods should only be encountered by sanity-shaken antiquarians and librarians in the 1920s, I can virtually guarantee that you will enjoy some if not all of the stories collected here. These are all refreshing looks at familiar horror themes viewed through the new lens of space opera and science fiction. Highly recommended for those who like some horror with their science fiction – clearly two tastes that taste great together. BARNES & NOBLE ISN’T DOING SO HOT: Probably not exactly the news of the century, and frankly, it’s not a huge surprise. We all know that Borders’ collapse gave its competitors Barnes & Noble and Books-A-Million some breathing room, but that’s probably not enough in the long-term. Stores that sell consumable media — like Best Buy and B&N — as well as brick-and-mortar stores that sell stuff that’s available cheaper online aren’t doing so hot these days. Apparently B&N’s Christmas sales weren’t great and its Nook business is slowly being overtaken by a combination of Kindles and iPads. Dedicated eReaders, I’ve read, are slowly but surely being squeezed out by various kinds of tablets. I only have a Kindle 3 myself, enjoy it very much, and have no plans to purchase a tablet PC any time soon, but I’m apparently in the minority. We’ll see where this goes, but expect a round of B&N store closures by next spring at the latest if this year’s sales continue their decline. Of course, all this begs the question: where exactly do people go to browse for books and discover new ones if they can’t examine store shelves full of them? This is a problem that Amazon has not yet figured out how to solve. INTERVIEWS WITH IAIN M. BANKS: If you enjoy space opera and/or transhumanist SF, then you really should give Iain M. Banks’ Culture series a try. It’s been a long-time favorite of mine, though it does require some careful thought, as these aren’t what I typically think of as ‘easy” reads. Imagine a kind of post-scarcity interplanetary utopian society run by a coalition of extremely powerful artificial intelligences and you’ll picture something close to the eponymous Culture (that quick description glosses over all the most fun elements of the setting, but it’s a start. 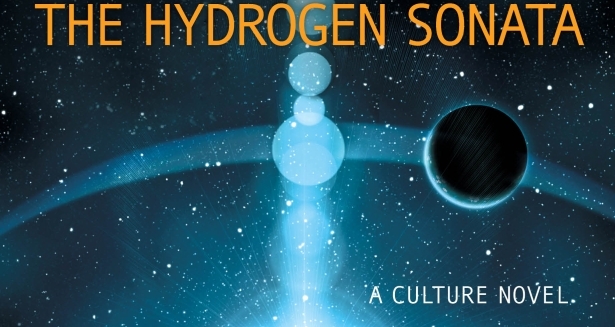 Last year, Banks came out with a new Culture novel, THE HYDROGEN SONATA, and has been interviewed about that novel, his views on utopia, technology, and many other issues. Here is one very recent interview with Banks, and here’s a second from last November that I just happened upon. 20 HEROIC (FICTIONAL) LIBRARIANS: It’s probably no surprise that I love libraries almost as much as I love books. I’ve spent a good chunk of my life in various libraries, after all, and I regularly consult with librarians for my academic research. But as much as I like real-life librarians, I love the fictional heroic, super-heroic, and magical kind of librarian even more. 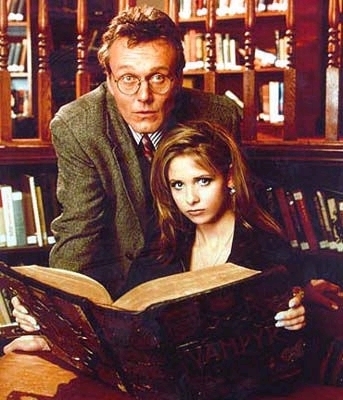 Here’s a great list with illustrations and descriptions of twenty fictional badass librarians. This is an outstanding collection of two short science fiction novels. Remember the old Ace Doubles each containing two separate novels, two covers, and you flipped the book over to read the second novel? The Wildside Doubles are just like that, though they are trade paperbacks rather than mass market paperbacks. Because the novels are entirely unrelated, I’ll review them separately below. Some mild plot spoilers follow. 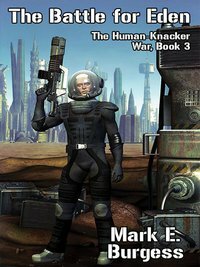 THE BATTLE FOR EDEN by Mark E. Burgess is the third short novel in the Human-Knacker War series. (I reviewed the omnibus edition that collects the first two novels in the series, by the late Ardath Mayhar and Robert Reginald, respectively, here.) The series is set in an indeterminately far future in which humanity has colonized a host of new worlds before encountering the implacable Knackers, a species of ravenous crustacean-like predators who conquer and devour all other species they encounter. And the Knackers are not just vicious foes; their technology is superior to that of humanity, they essentially refuse to communicate or negotiate, and they have so far been winning battle after battle in the war. Thus far, all three of the Human-Knacker War novels have focused not on the major battles and strategies of the war, but on how ordinary people become caught up in this existential conflict and must overcome their own personal circumstances to survive. While this premise could easily result in a dark, depressing tone to the books, all three have managed to strike a balance between the very real threats faced by the protagonists while still holding out hope for both the individuals involved and humanity as a whole. THE BATTLE FOR EDEN opens with a surprisingly interesting and well-done space battle but soon shifts to the surface of the remote human colony world Eden, when a human space pilot, Major Simon Roy, is forced to crash land and throw in his lot with an extended family of colonists in the wake of a Knacker victory. Roy and the colonists must fortify and defend an isolated farmstead against the inevitable Knacker ground forces. What follows is a clever and engaging battle of wits and ingenuity as the humans must rely on smarts rather than superior technology just to stay alive. Along the way there are some nice allusions to events in the previous books (all well-explained, so that they are not confusing for readers who haven’t read those yet). THE BATTLE FOR EDEN likewise does a good job of advancing the larger plot of the series, showcasing some new developments in the larger war while retaining the charm and individual focus of the previous books. Needless to say, I am very much looking forward to the next Human-Knacker war book, as well as more fiction from Mark Burgess. This was the first book by Burgess I have read, but his characterization, dialogue, and plotting are all outstanding and I look forward to reading much more of his work. UNDER THE EMBER STAR by Charles Allen Gramlich is a rousing science fiction tale of a streetwise young woman named Ginn who was left to her own devices at a young age when her archaeologist father was killed. She lives on Kelmer, a distant human colony world, which features a native humanoid species, hostile terrain, an enigmatic past, and a cooling sun that promises to slowly worsen the planet’s climate. Ginn is hired by an inscrutable member of the native species for a job that will take her into Kelmer’s wilderness, battling human and alien foes who seek to stop their quest, in an effort to learn more about the planet’s origins and the involvement of a long-lost alien species. Gramlich’s worldbuilding is superb; Kemler never ceases to seem like a real place, and Gramlich’s construction of a relatively primitive alien culture in a tense but not entirely antagonistic relationship with human colonists is some of the best I’ve seen in years. This fast-moving, well-written adventure yarn is an exceptional science fiction story. I actually found UNDER THE EMBER STAR’s subtitle – “A Science Fantasy Novel” – to be a little misleading, as there aren’t really any “fantasy” elements I could point to. This isn’t a “hard” science fiction novel by any means, but there’s certainly no mix of magic with rayguns and starships, as I typically think of “science fantasy” stories. I certainly hope we see a follow-up to UNDER THE EMBER STAR soon. The protagonist Ginn and the planet of Kelmer both have a lot more depth to explore. In many ways, while the novel is certainly complete and self-contained, the climax of the story left me wanting to know what happens next (always a sign of a good thing, I suppose). This short novel compilation is highly recommended for fans of science fiction, especially those interested in the human dimension, rather than the technological, of science fiction. I genuinely enjoyed both books, even more than I thought I might from their initial descriptions, largely because of the strength of both authors’ writing. No prior knowledge of the first two Human-Knacker War books is required to fully understand and enjoy Burgess’ tale, so don’t let that deter you from picking it up. Burgess and Gramlich both know how to tell engaging, fast-moving science fiction adventures and I hope to see their work receive much more attention in the future. While I’m not an entirely dour and humorless sort of fellow, I rarely find myself reading humorous stories and novels. They just rarely appeal to me. But I must admit that the GUMMI BEAR OMNIBUS really appealed to me as a genuinely fun work of comedic science fiction. It’s a light-hearted, fun, quick read. Most people enjoy those delightful little gummi bear candies – my personal favorites are the German Haribo gummis. I’ve been eating these things ever since I was a child. Most of us, I think it’s probably fair to say, think of them as a sweet (literally), innocent candies. But what if they weren’t? What if these things were sentient, alien creatures bent on dominating the galaxy and annihilating all rival species – like us – they encountered? It’s a pretty wacky idea that forms the essential premise of THE GUMMI BEAR OMNIBUS. 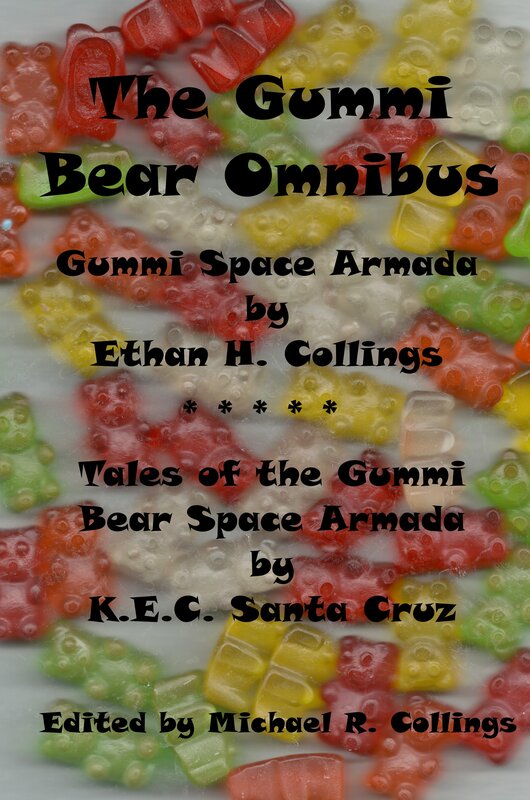 The main body of the omnibus consists of two lengthy poems: “Gummi Space Armada” by Ethan H. Collings and “Tales of the Gummi Bear Space Armada” by K.E.C. Santa Cruz. We also have two “commentaries” (humorous essays written in academic style) by “Bjørn Cummis” and “Bergetah Kuma.” I am probably on safe ground to say that these latter pieces were penned by the esteemed editor of the collection, Michael R. Collings. Both the poems and the essays brought a smile to my face as I read them. How can you go wrong with the idea that gummi bears are determined to ANNIHILATE their enemies (to include pretty much anything that’s not a gummi bear)? The essays at the end of the omnibus provide some gentle satire of typical academic prose and literary criticism, so as someone who reads a lot of scholarly articles, I found those to be a particularly nice touch. I recommend this one wholeheartedly. It’s inexpensive, it’s a quick read, and it’s genuinely entertaining. If you have a zero tolerance policy for all forms of puns, or are even dourer than I am, then give it a pass, but otherwise, the GUMMI BEAR OMNIBUS should provide an enjoyable diversion. Now let’s just hope that the Gummi Bears’ Armada never locates earth…. I haven’t done one of these in a while, so I won’t attempt to literally list every book I have acquired since I did the last one. That would be…a lot of work. So what I’ll do here is focus on the books I acquired during my recent trip to San Diego and Los Angeles. I’m an east Coast-kind of guy, but I usually manage to make it out to California at least once a year. I love the weather, though the lack of seasons, earthquakes, and wildfires bug me. I ended up hitting three used bookstores in the Encinitas/Cardiff area, and wasn’t incredibly impressed. Two were tiny and with unimpressive stock. The store I bought the two books from had one of the worst organization (non-)schemas I have yet encountered and one of the others had some good stuff but was WAY too expensive. I always kind of resent paying a premium for the store’s location. If anyone know of a particularly good used bookstore in the greater san Diego area, let me know, as I have not yet found one I really like there yet. Still looking. More impressively, I spent a day in the Burbank/North Hollywood area doing nothing but pawing through used bookstores. The day started off with breakfast with a friend I had never before met in the flesh! We’ve been corresponding for years about all things bookish (and otherwise) but had never had the chance to meet in real life. Fortunately, neither of us turned out to be serial killers so we spent the day talking about books and going to four great used bookstores. The first was Dark Delicacies, a really nice shop that specializes in horror. They seem to do LOTS of book signings there. Had a good conversation with the proprietor, Del Howison. Then it was off to two stores that were across the street from each other: Brand Bookstore (on Brand St., natch) and Mystery and Imagination. Brand is a general-purpose used bookstore and had some good stuff. I’d be proud to have this one in my own area, though it was the least interesting of the four L.A. stores. 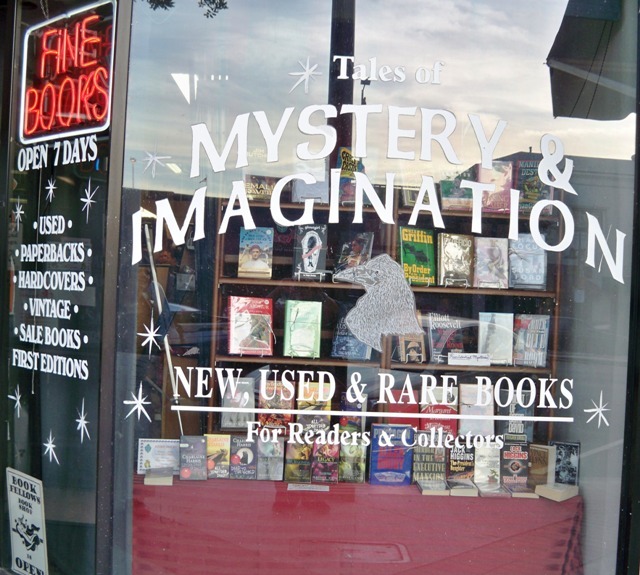 The next was Mystery and Imagination, a used bookstore specializing in pulp, SF/fantasy, crime/mystery, etc. They also do lots of signings, and had a nice chat with Christine Bell, one of the proprietors, who also took the time to show me some signed books I just didn’t have the money to purchase. The final stop of the day was the Illiad Bookshop, the largest of the four stores and one with used books of all kinds. Lots and lots of books there. All in all, it was a great way to spend a day: booking and hanging out. I HIGHLY RECOMMEND all of those stores and am looking forward to checking them out the next time I find myself in the Los Angeles area. I also hit a local used bookstore that I had let lay fallow for a while when I returned home. The second Solar Pons collection by August Derleth. Pons was a Sherlock Holmes rip-off with just the names changed. I have the first volume (though I have not yet read it); there were seven altogether. I have heard this one also contains a Fu Manchu crossover, which I’m looking forward to. Eight more Richard Blade men’s adventure novels. Kind of a guilty pleasure of mine. These have so far been pretty formulaic, but there’s something about them that’s very appealing. Philip Jose Farmer’s Flight to Opar. My goal is to complete my collection of Farmer’s various pulp pastiches and sequels to classic adventure novels. Dennis Wheatley’s The Fabulous Valley. Not one of his Black Magic novels, but looks like a fun one about an inheritance and an ill-fated expedition to Africa. How can you go wrong with that? Talbot Mundy’s Queen Cleopatra. Part of the Tros of Samothrace historical fiction series. I’m also very interested in collecting the rest of his Jimgrim novels. James Blish’s A Case for Conscience. I’ve been looking for this one for a very long time. Three Vatican conspiracy thrillers by Daniel Easterman. It’s a fun sub-genre that I’m interested in, and Easterman has written a lot of these sorts of books. Brian Lumley’s Iced on Aran, the fourth of his Dreamlands books. Not everyone likes Lumley’s particular vision of the Cthulhu Mythos, but I applaud his efforts even though there are some aspects of his writing I don’t care for. Still need the third one though. Two sword and sorcery novels by Lin Carter: Thongor in the City of Magicians (just need one more Thongor novel to complete my collection) and Down to a Sunless Sea (this was the last of his Mars series that I needed). Desmond Cory’s Undertow and Timelock. One of his Johnny Fedora series (I have one other). A friend turned me on to these. They are a surprising challenge to collect. This is going to be a very long-term project as they are hard-to-find in stores and expensive to purchase online. Turn Loose the Dragon by George C. Chesbro. One of the last of his books that I needed. This one is a stand-alone, but I really like his Mongo Mysteries. Legend in Blue Steel by “Spider Page.” The final Spider novel, published in 1979 with all the names changed for legal reasons. Supposedly not an awesome novel, but for a completist fan of the Spider – one of the most brutal and over-the-top pulp heroes – this was a must-buy. Never seen it “in the flesh” before. The three Magira books (War Gamers’ World, Army of Darkness, and Messengers of Darkness) by “Hugh Walker,” published by DAW. I love all DAW books for their covers and trade dress, but this set really intrigued me. These were written by German author Hubert Strassl and were inspired by a long-running German fantasy wargame in the 1970s. Looking forward to reading these. Mike Hammer omnibus #1 (first three novels). I already own a copy of this one – so why did I buy this? Well, because this copy was signed by both Mickey Spillane and Max Allan Collins. How could I pass that up? Dark Delicacies II: Fear, edited by Del Howison and Jeff Gelb. Bought from Del Howison himself, and signed by both editors. Looks like a great scary collection. Beastmarks by A. A. Attanasio. I really enjoyed his Radix Tetrad (weird, wonderful, mind-bending SF at the end of time that hasn’t received nearly enough attention; seriously, a dissertation could be written about this series). This is a collection of his short stories I didn’t even know existed. Emerald Eyes by Daniel Keys Moran. Read this years ago and have the rest of the Continuing Time series (except the last one, which has only been released in eBook format thus far. The Man of the Future (chapbook) by Edward Bryant. Not familiar with the author, but it was illustrated by Dan Simmons (!) and signed by both Bryant and Simmons. Also picked up a variety of odds and ends, mostly one-off mass market paperbacks, but I don’t want to list each and every one, so I’ll just stop here. So that was a really fun (and successful) trip!